Valve has unveiled the official Portal 2 box art and while it's strictly a matter of taste, I just don't care for it very much. I'm not going to bother describing the box art since, you know, it's right there for you to look at. But it's interesting that Valve appears to have chosen to focus on the two-player co-op aspect of the game rather than the ongoing story of Chell and GlaDOS, the characters who drove the original Portal. I also think, and this is where the "matter of taste" comes in, that it's pretty ugly. Maybe not "ugly" in the strictest sense - it's certainly no Planescape: Torment - but definitely underwhelming. A robot jumping through a portal while another robot (is that a Modron?) looks on isn't exactly a dramatic, grab-you-by-the-collar image, and while most game box covers never rise above the merely functional, I can't help but think that this is an opportunity missed. The stark visual style of Portal and the majesty of GlaDOS in all her imposing techno-grandeur both strike me as great material to work with. Instead, we get... this. Am I being a jerk here? Looking back, I can't think of a single Valve box that really turned my crank, so maybe the problem here is me. Am I being unfair? 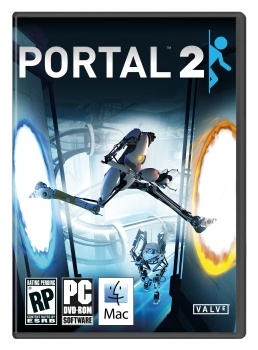 Portal 2 is scheduled to come out on April 18 for the PC, PlayStation 3, Xbox 360 and Mac.